Note, I got this as a used gun. Some of the points I make may be useful if considering purchasing one new, but many of us are on tight budgets and considering a used one as an alternative. I don't consider myself a gun expert, but a gun realist. Reality is that any gun is better than none at all. I would, if I were you, take any gun you're considering purchasing to a competent gunsmith to make sure it's in good condition. I've seen too many horror stories of people cobbling them together out of mismatched parts and selling to them to unsuspecting buyers. These kinds of defects can cost you your life. Other than the aforementioned magazine release problem, the grip and some minor wear to the finish, the gun I got is in excellent working order. Used guns will come with scuffs, wear on the finish, and other blemishes and these shouldn't discourage a potential buyer from giving one a good home. Off my soapbox. Three weeks after sending the gun in with a broken magazine release to Gander Mountain, I got it back with a new magazine release and grip. The work it needed was fairly minor, and even $20 shipping for Bersa to fix it wasn't bad at all. Yes, they actually fixed it. I'm impressed it only took three weeks. The Bersa Thunder UC Pro .45 loaded with seven rounds weighs in at 33 ounces, is about 6 8/10 inches long, 5 1/10 inches high and nearly an inch and a half thick at the grips. 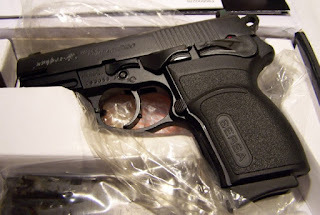 Other than the weight and thickness, it's nearly identical in size to the Ruger Sr9c which I also use as carry gun. It's also about 3/8 inch wider, about 1/3 inch taller (and has one more round capacity) and weighs six ounces more than a Glock 36, which is about $200 more retail. Magazines are about $50 apiece and all are seven round capacity. The materials are forged steel for the barrel and slide, and all are treated with Tenifer. The finish on these has a reputation of fading out as the gun ages and wears, (but thus far rust hasn't been an issue). The frame is made of an aluminum alloy and the one piece grip is made of hard rubber. The safety features are a firing pin block, safety/decocker, and a loaded chamber indicator, as well as an internal lock that turns this weapon into a paperweight. There is no magazine disconnect, so it will go "bang" regardless if you press the trigger and there's a round in the chamber. By the way, I've seen this gun retail new for about $375 to $400. These, as Jack Webb would say, the facts and just the facts (and I'm dating myself big time, I know) The rest is a bit more subjective, so here goes. So far I've carried this gun on and off for a month and in spite of its mass, carries comfortably with the right holster. It needs to be leather or suede if worn in the waistband. Synthetic materials will not hold up to the slide release or safety on this gun, with the result being a less than comfortable carry. Good news is you can get a decent suede holster for less than $50. Mine came with a Vega, but a Blackhawk tuckable will also work. Look for something that can hold a Glock 19 or 30 and you should be fine. As for fitted holsters, you'll have to wait as there aren't any as of this writing. There are also some you can custom fit out there, but the simpler ones seem to work the best and print less anyway. I've carried this gun everywhere and no one has done so much as toss a frown. Operating this gun, despite the frame mounted safety, is very straightforward. All you have to do is point the gun, click the safety down, press the bang switch and provided there's a round in the chamber, it makes a noise and a hole. Because this is a double/single action using a hammer, the trigger pull on the first round is about nine pounds and rest are about four. Once you empty the magazine, push the release and push in a full one. All that's needed is to push the slide release and keep shooting in single action. If you don't want to shoot, use the safety to decock it. Unlike some writings saying that you can hold the hammer back and pull the trigger to do the same, I haven't been foolish enough to try. That decocker is there for a reason, so use it and save yourself some embarrassment at least or a lot of sleepless nights at worst. Enough said. The sights on mine are not unlike those on the fourth generation Glocks, although they're advertised as Sig Sauer type. The goal post setup is a bit controversial, but the sight picture is decent. If you want night sights, try a gunsmith or buy a light for the accessory rail. I usually carry a tactical light anyway, so this isn't a huge concern. Accuracy is decent for a .45 with a three and a half inch barrel, and I managed to keep all but two or three out of the 50 rounds on paper at 20 feet. The rounds I used were Independence (El Cheapo) and had one failure to feed. This could have been my technique, the ammo (as my dad suggested) or even the feed ramp. At any rate, it wasn't a deal-breaker, took just a second to clear out and I was back in action. Even though this gun has some mass, there is a little muzzle flip and it is a bit more than my 9mm Ruger. However, it isn't uncomfortable or unmanageable to shoot. Some shooters have indicated "hammer bite" but I'm more inclined to call it "hammer touch" and this is the hammer being pushed down as the slide is thrown back. It isn't any more than someone lightly touching your hand with their finger, but can be disconcerting for some. My advice as with any semi auto is to keep your mitts where they should be and personally, the slide hurts a helluva lot more. If it bothers you that bad, buy a striker fired pistol. However, if you're in the market for a good, reasonably priced handgun in a .45 ACP, the Bersa Ultra Comnpact Pro may not look like much, it has it where it counts. It's a tough, sturdy and dependable firearm that's easy to shoot. Parts are relatively inexpensive and easy to get. 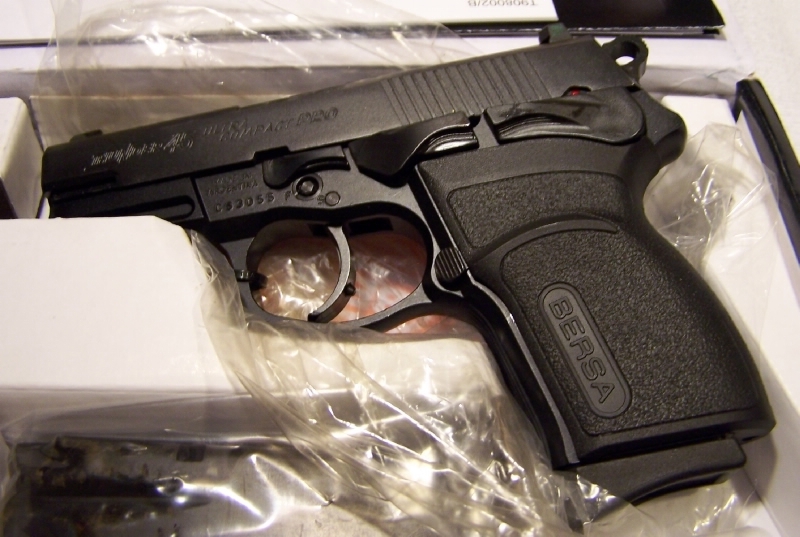 Bersa also takes care of their customers to the extreme that's unheard of in a lot of products nowadays. It's also the easiest semi auto handgun I've seen to field strip in a long time. Just push the takedown lever and it's practically apart. Getting it back together is only slightly harder. Bersa proves that you don't need to spend a grand on a 1911 (and I like 1911's) to get a good piece in a .45. This gun is worth checking out, and even buying. Maranatha! Please obey all laws concerning concealed carry in your state and locality and all pistol free zones. Use common sense (that trait so rare it should be a superpower) as well as never pointing a gun at anything you don't want to destroy. The Glock was over $600 and this was $250, and that made up my mind. Going to pick up mine today, i'm a Glockaholic so going with another brand was a big step for me but i just plain fell in love with this Bersa, and to top it off its almost impossible to find a Glock 30 SF. My local gun dealer gave me a smoking deal on it and i owned a Bersa .380 several years ago and it was a great little gun, my sister wanted to learn to shoot so i took her out and let her shoot the little .380 and the rest is history, she called me on an old debt so she went home with my .380. I wilk post my results friday morning, i have a early thankgiving morning date at the range. I almost bought a Glock 30 SF. But at $600 for that and $250 for the Bersa, which has an external safety, this was no contest. Fired 300 rounds and not another problem. Easy Fix for Natural Gas to LP or Vice Versa.